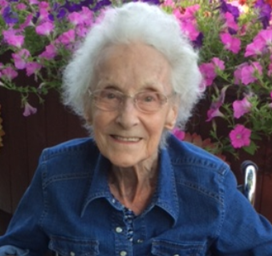 Edith Mildred Coleman, 93, journeyed home to the Lord on Thursday, May 3, 2018. A private celebration of her life will be held at the Range Funeral Home in Virginia, MN on Friday, May 11, 2018 at 11:00 AM. Interment will be at Maple Hill Cemetery, Hibbing, MN. Memorial donations may be made to the Alzheimer’s Foundation of America. Arrangements are with Range Funeral Home in Virginia. To sign the online guest book or to send condolences, please visit www.rangefuneralhomes.com. She was born November 24, 1924 in Rice Lake, Wisconsin, the fourth of eight children born to dairy farmers, Percy and Lorene Smith. She remained in Rice Lake and helped maintain the family dairy farm during the Great Depression. She met the love of her life, Howard Dail Coleman and was united in marriage on December 8, 1941 in Pine City, MN. During World War II Edith relocated to Minneapolis and worked as a nanny while Howard served in the US Army. Together they spent the next 48 years raising a son and three daughters, and sharing their passion for the outdoors including camping and fishing. In Edith’s opinion, nothing compared to a freshly caught fish dinner and highlights of her fishing adventures included catching salmon in Canada, walleye in the Boundary Waters, smelt on Lake Superior, and bullheads on Deer Lake. Edith was a remarkable homemaker and took great pride in her surroundings, especially tending to her flowers and vegetable gardens. As many women of her era, Edith reigned in the kitchen with her cooking, canning, and baking skills. She especially loved hosting many homemade dinners and holiday festivities where family and guests savored everything made fresh from the garden and prepared to perfection. Edith loved dogs, antique cars, picking berries, picnics, riding her bicycle, and spending time caring for her grandchildren. She was a woman of great faith who loved her family and helping others in need with generosity and compassion. Edith’s resiliency and desire to persevere amidst illness was admired by many. The family would like to thank all of those who reached out to provide her with much needed support. Edith was preceded in death by her parents, husband Howard Dail Coleman, son Michael Howard Coleman, sisters Lillian White, Phyllis Sorenson, and Viola Howard; brothers, Leland Smith and Dale Smith. Edith is survived by her much-loved daughters Kathleen (Alvin) Burmaster, Shannon (Duane) Yachwak, and Susan Wiirre (Stephen) Lindberg; and her dear brother Earl (Francis) Smith; Grandchildren: David (Dianna) Schmidt, Bambie (Craig) Egle, Jessica (Shawn) Brown, Jeremy Yachwak, and Jacob (Heidi) Sundquist; several great and great, great grandchildren; many special and loving nieces and nephews; and cherished friends all of whom will miss her dearly.